Up until recently, no known dinosaur fossils were found in Washington State. But on the shore of tiny Sucia Island in the San Juan Islands, paleontologists (geologists who study past life) from the Burke Museum found one! They found a thigh bone of a theropod, a carnivorous (meat-eating) dinosaur (much like a velociraptor) that lived about 80 million years ago. The fossil is currently on display in the lobby of the Burke Museum, and the lucky paleontologists have written up their preliminary findings in the journal Plus One. Geologic time scale, showing eras, periods, and epochs, geologic time symbols, and the major events that formed Washington. 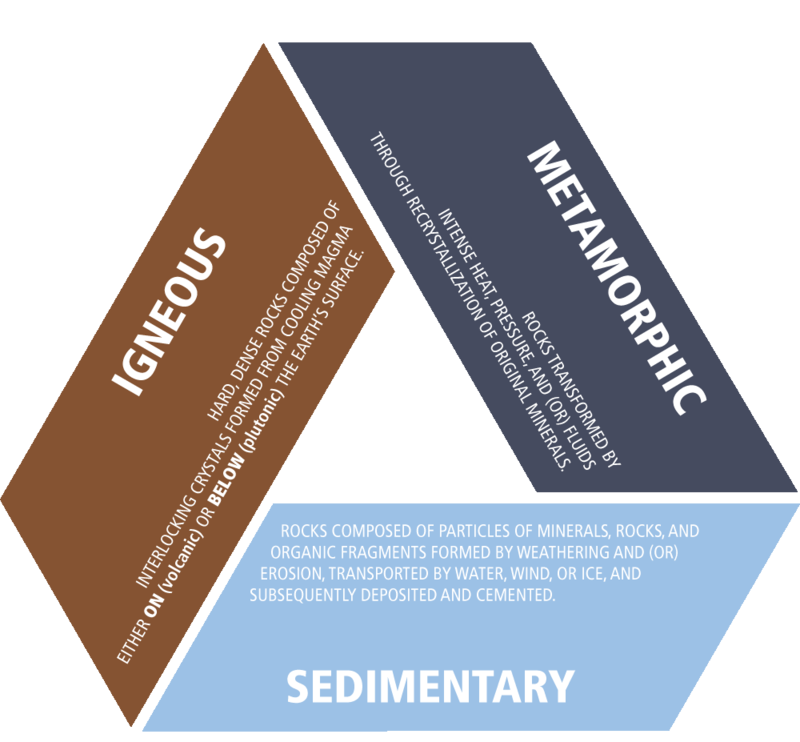 The three main rock types: igneous, metamorphic, and sedimentary. The presence of certain naturally occurring elements, such as arsenic, asbestos, mercury, and uranium can make exposure to the rocks that contain them hazardous. Asbestos is the general term for a number of minerals belonging to the serpentine and amphibole groups that have similar properties. Asbestiform minerals are composed of very thin, long fibrous crystals, and it is this fibrous nature that makes them dangerous. Asbestos is frequently associated with serpentinite and partially serpentinized ultramafic/ultrabasic rocks (however, not all ultrabasic rocks are serpentinite bearing). WGS has compiled data pertaining to historic prospects and (or) mines within Washington known to have produced asbestos as a primary commodity or as a byproduct of mining. Mercury, called quicksilver by miners, is silver to white, and the only metal which is liquid at room temperature. It is typically extracted from the mineral cinnabar by heating the crushed ore.
Mercury is highly toxic and can be absorbed through the skin or inhaled as mercury vapor. Mercury may also enter the food chain and become a health hazard to animals and humans. WGS has compiled data pertaining to historic prospects and (or) mines within Washington known to have produced mercury as a primary commodity or as a byproduct of mining. Arsenic is found in many rocks and minerals and is generally associated with sulfur. The most common arsenic minerals are arsenopyrite, and the sulfides, realgar and orpiment. These minerals can cause respiratory problems when inhaled, particularly at mine sites that are popular for motorized recreational vehicle use. Additionally, water discharged from metal mine openings may contain these same minerals in solution and present a health hazard to humans and animals. Arsenic is especially dangerous when it contaminates groundwater and poisons drinking water. WGS has compiled data pertaining to historic prospects and (or) mines within Washington known to have produced arsenic as a primary commodity or as a byproduct of mining. Radon is produced by natural radioactive decay of uranium (and/or thorium) and is particularly associated with uraniferous two-mica granites. Radon is carcinogenic and a prominent cause of lung cancer. Radon is colorless, odorless, and tasteless, making it exceptionally hazardous, as its presence is revealed only by specific detectors. WGS has compiled data pertaining to historic prospects and (or) mines within Washington known to have produced uranium as a primary commodity or as a byproduct of mining. WGS has compiled data from 1:100,000-scale geologic mapping and a uranium-bearing mineral geology dataset produced by Goetz (1993) to produce a classified dataset showing radon hazard. Coal is a sedimentary rock that is composed mainly of carbon. Coal is formed through the metamorphism of peat over millions of years. Peat is formed in bogs and marshes from plant matter accumulated over thousands of years. As the peat is metamorphosed through high pressure, coal is formed in three distinct grades: lignite, bituminous, and anthracite coal. Biekman and others (1984) and Valentine and Huntting (1960) published known coal fields in Washington State, where coal reserves and resources have been identified and characterized. Aside from known coal fields, coal has been documented or reported in other discrete locations in Washington State. Biekman and others (1984) and Vanlentine and Huntting (1960) published known coal fields in Washington State, where coal reserves and resources have been identified and characterized. The Geology Data Portal provides historical coal mine maps and locations. Some of the maps are not georeferenced, and are provided as links through each individual location point. Other maps are georeferenced and are shown as a separate layer containing the extent of each map. Metallic minerals are elements or compounds that are generally hard, shiny, malleable, and usually have good electrical and thermal conductivity and high density. These characteristics make them desirable for use in most of the products we use every day. We have electronically compiled thousands of documents, maps, and data from multiple sources to provide access to metallic mineral data in Washington State. 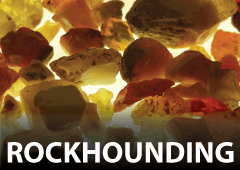 Geologists use the term 'Industrial Minerals' to describe nonmetallic minerals that have economic or industrial uses. Their characteristics and means of formation are highly variable. WGS has electronically compiled nonmetallic mineral data for Washington State. WGS has compiled earthquake epicenter locations and depth for events exceeding magnitude 1.0. Included for each event are latitude and longitude coordinates, earthquake depth, an observed date and time, and an earthquake magnitude. Data were collected from the Pacific Northwest Seismic Network (PNSN) catalog. WGS has relocated earthquake hypocenters for events greater than magnitude 1.0 with depths shallower than 25 km throughout Washington State. Earthquake data were obtained from the Pacific Northwest Seismic Network (PNSN) catalog and have been analyzed using the earthquake hypocenter relocation program, hypoDD. The hypoDD program uses the double-difference earthquake relocation algorithm of Waldhauser & Ellsworth (2000) to relocate earthquakes clusters relative to one another, in some cases revealing previously unobserved linear trends. The double-difference method reduces the error of predicted travel times for event raypaths. Linear trends between earthquake locations within a region have been used to locate unmapped faults. For more information on hypoDD please visit http://www.ldeo.columbia.edu/~felixw/hypoDD.html. Unfortunately, not all earthquakes in WA state were able to be relocated due to insufficient occurences or recordings (lack of seismic stations) of surrounding earthquake events. Earthquake data shown on the Washington Geologic Information Portal is meant only as a general guide to areas prone to earthquakes. It is not a substitute for a site-specific investigation to assess the level of risk for any development project. It cannot be used to determine the presence or absence of faults beneath any specific locality. Such a determination requires a site-specific geotechnical investigation performed by a qualified practitioner. Lots more information can be found on our Earthquakes and Faults webpage. For WGS, active means that a fault or fold has evidence for movement within the Holocene time period (since about 12,000 years ago). It usually also means that there are earthquakes (even small ones) documented to have occurred on the fault. Other faults that have evidence for movement within the Quaternary (last 2 million years or so) are also of concern. Washington has dozens of faults, fault zones, and folds with evidence of movement in the Quaternary. Some of these features are in remote areas. Others, like the Seattle fault and southern Whidbey Island fault zone, cross under major cities and pose a significant hazard. WGS has compiled these data electronically from many sources. The data contains multiple interpretations of the same faults or fault systems by different authors, which may be only partially co-located. Differing interpretations result from different fault-detection methods and different scales of investigation. Care should be used the data to ensure full understanding of the scope of past work and breadth of interpretation of the fault of interest. 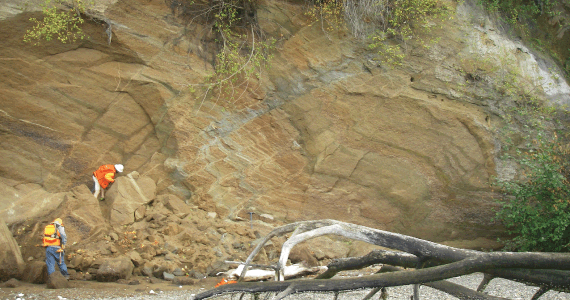 Geologists use many techniques to located Quaternary-aged faults. Typically, once a fault feature has been identified in the landscape (usually with lidar), a trench is excavated across it in order to determine the direction of fault movement, the timing of earthquakes, and the recurrence interval. Finding faults and knowing how often they rupture is one of the most important tasks to keep society safe from these hazards. After earthquakes, geologists go out into the damaged areas to document effects of earthquakes. Often, these observations are used to inform building codes and improve building retrofit designs. The dataset shown on the Geology Portal inventories all known documentation of effects of several major earthquake events in Washington State. The data indicate the types of damage or effects observed at that location, the sources of the information, and shows photographs of the damage, if available. More information about earthquakes can be found on our Earthquakes and Faults webpage. A landslide generally refers to the downhill movement of rock, soil, or debris. The term landslide can also refer to the deposit that is created by a landslide event. We have developed two different types of landslide data. The Landslide Compilation consists of an inventory of mapped landslides from many different sources. This compilation is not comprehensive. Read more about this dataset below. The Landslide Inventory is a collection of detailed landslide mapping using lidar and following the protocol of Slaughter and others (2017) and Burns and others (2012). This data is intended to supercede the landslide compilation. The landslide inventory dataset contains landslides mapped using lidar following the mapping protocols of Slaughter and others (2017). The dataset consists of several layers, including landslide deposits, landslide scarps, scarp and flank areas, as well as deep and shallow landslide susceptibility modeling. These landslide data are intended to supersede the landslide compilation dataset (see below). This layer shows polygons that outline the extent of landslide deposits. Select attributes within the layer include the relative age and type of landslide, the headscarp height, failure depth, volume, and the year of movement, if known. This polygon layer traces the extents of the flanks and scarps in areas affected by landsliding. This layer shows the traces of headscarps and internal scarps of a landslide. Streamlined Landslide Inventory Protocol (SLIP) landslides were mapped using a simplified procedure, wherein the footprint of the landslide deposit and the scarp and flank area are combined into one polygon. Only the identification confidence is recorded for each landslide. Fan deposits are cone-shaped deposits at mouths of drainages. Sediment on fans is deposited by streams, floods, and (or) debris flows and are typically sourced from a single channel. This raster layer estimates where shallow landslides are more likely to occur in the future. This modeling uses the slope of the ground surface to calculate a factor of safety, a value used widely to describe slope stability. For details in the modeling process and the definitions of high and moderate susceptibility, see Mickelson and others (2017). This raster layer estimates where deep-seated landslides are more likely to occur in the future. The modeling incorporates landslide-susceptible geology, geologic contacts, slope angles, and the direction of movement. See Mickelson and others (2017) for detailed information about this process. As landslide inventory areas are published, the study areas show parts of the county or counties mapped either in detail or using the Streamlined Landslide Inventory Protocol (SLIP). Also present in this data are areas that are either not yet mapped using the landslide inventory protocol, or areas that have not yet been analyzed for landslide susceptibility. WGS has compiled an incomplete inventory from many sources of landslides mapped in Washington. Care should be used in using this data. The absence of a mapped landslide in a particular location does not suggest no landslide exists or that there is no landslide risk. This dataset is not intended as a substitute for a detailed investigation of potential slope instability by a qualified practitioner. Site-specific data may give results that differ from those displayed on the map. To avoid the risk of misinterpretation, invalid results, and erroneous conclusions, users must consider original map scale, collection methodology, currency of data, and any other conditions specific to every data element and each dataset as a whole. Landslides mapped at 1:24,000 and 1:100,000 scale during surficial geology mapping were extracted for display on the Portal. Landslide mapping was not the primary purpose of these projects, and some geologists may not map a landslide for various reasons. Though many of the landslides are field-validated, there are many landslides missing from this inventory. Also, due to the scale of the final mapping product, landslides with deposits too small to be identified in 24,000-scale mapping (for example, debris flows, debris avalanches, rock topples, etc.) are not typically included. Only partial coverage exists for landslides mapped at 1:24,000 scale. 1:100,000-scale mapping covers the entire state. WGS has compiled landslides in Watershed Administrative units (WAUs) identified using Watershed Analysis systemic protocol. Statewide coverage is incomplete at this time. Widespread rain or rain-on-snow events in Washington can produce significant and widespread landsliding. WGS has compiled landslides mapped from surveys immediately after several of these events. Mapping techniques for these large-scale surveys vary between aerial surveys from small aircraft, aerial photography, or lidar identificaiton. All reconnaissance-scale landslide mapping occurs with minimal field verification. Aside from geologic mapping, storm reconnaissance or watershed analysis, WGS has compiled landslide data from many sources focused on landslide mapping. Each project has its own protocol and methods, so it is up to the user to determine how best to interpret the landslide data. To avoid the risk of misinterpretation, invalid results, and erroneous conclusions, users must consider original map scale, collection methodology, currency of data, and any other conditions specific to every data element and each dataset as a whole. WGS has compiled a reconnaissance-level, remotely sensed, layer that identifies geomorphic features typically representative of potential, deep-seated landslides. Interpreted by a single analyst using a geographic information system (GIS), this product is considered an initial screening for potential deep-seated landslides and should be considered the first phase of a multi-phase approach to assess slope stability on 2,200 miles of Salish Sea shoreline (primarily Puget Sound). The output of this analysis is polygons designating landforms that have some of the characteristics of deep-seated landslides, but lack the thorough investigation necessary to classify a landform as a landslide. If you've been to beaches and coastal communities in the Pacific Northwest, you've probably seen signs like these. 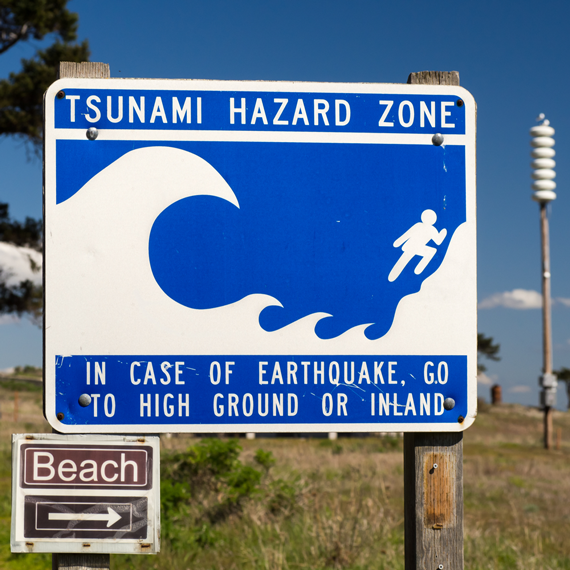 These signs tell you that you are in a place that is especially at risk for tsunamis. The Survey works with NOAA to model the inundation of coastal areas from tsunamis. This is an important step for learning what areas will be affected by tsunami waves. The models use the shape of the ocean floor, topography of the land, and the expected size and shape of tsunami waves. The result is a series of maps that show the depth of water and the speed of the currents. Modeling of tsunami inundation assumes a specific Cascadia subduction zone earthquake scenario. Currently, the landward limit of tsunami inundation from a Cascadia subduction zone earthquake is based on computer models of waves generated by two different scenario earthquakes, both with a magnitude of 9.1. Scenario 1A has uplift along the subduction zone. Scenario 1A with an asperity has an additional area of uplift closer to the Washington coast, just west of the core of the Olympic Mountains. The Tacoma and Seattle maps are modeled for an earthquake on the Seattle fault; all others are for a subduction zone earthquake. WGS distributes these data on the Portal and as individual publications. The Survey helps communities to prepare for tsunamis by identifying hazard areas (tsunami inundation maps) and areas prone to earthquake-caused ground failure. This information helps planners to select the best evacuation routes and assembly areas. We publish the hazard maps and evacuation maps both as PDFs and on our Geologic Information Portal. The portal includes an address locator to help people orient themselves and plan their best evacuation options. It is important to know the signs of a tsunami. Although there may be public tsunami warnings, these systems could be damaged during a large earthquake. Know what to expect. Know what to do. For people in Washington, the single biggest warning of a potential tsunami is a large earthquake. Hear a tsunami warning siren or receive a tsunami alert. Feel a strong earthquake near the ocean or a large lake. A strong earthquake is one that knocks people down, damages buildings, or lasts for longer than 20 seconds. Notice a very large approaching wave. See the water at the ocean disappear. As the tsunami approaches, sometimes sea level will rapidly drop as the wave gets taller. Notice an unusual rapid rise in sea level. Some tsunamis will have a surge in front of them as they approach land. These surges can be very damaging and dangerous. Notice a landslide that falls or slides into the ocean, a large lake, or a river. EVACUATE IMMEDIATELY! if you notice any of these signs or hear a tsunami warning. Tsunami waves can be 30-100 feet tall or more. If you cannot evacuate to higher ground, go as far inland as possible. If there is a large earthquake, roads and bridges may be damaged. It may be impossible to evacuate by car. KNOW HOW TO EVACUATE ON FOOT, even if that means walking along the road of the evacuation route. Assembly areas are designated in many coastal communities. These areas are not areas of refuge from tsunami inundation, but were selected to facilitate delivery of emergency services once the threat of tsunamis has passed. Many assembly areas are not specific in terms of boundaries; you may usually camp or park in adjacent areas. But, take care not to block roadways to leave access for emergency vehicles. For more information about tsunamis, visit our webpage. Many tsunami evacuation brochures show local landmarks such as fire stations, police stations, clinics, and hospitals on evacuation maps. These landmarks are only shown for points of reference and are not evacuation assembly areas, many of these landmarks may actually be in tsunami inundation zones. Tsunami evacuation brochure maps cover populated coastal areas. It is important to note that tsunami inundation is likely to occur along coastlines outside of the extents shown on evacuation brochures. 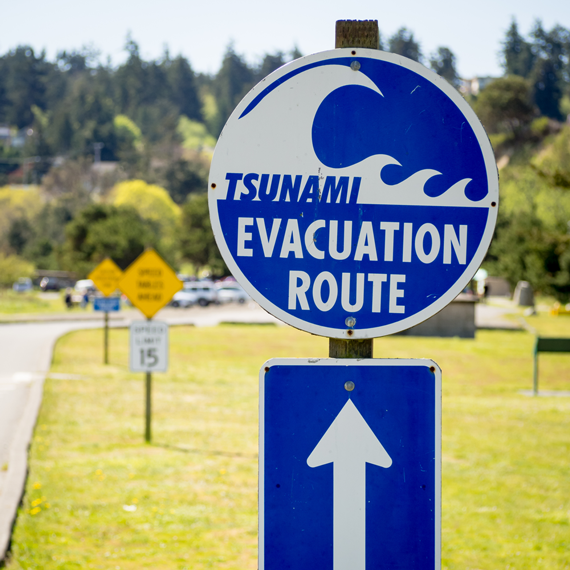 Tsunami evacuation routes were developed to guide coastal residents and visitors to safer locations. Evacuation signs have been placed along the main roads to direct motorists to higher ground. In some areas, there may be more than one way to reach safer areas; these routes are marked with multiple signs showing additional options for evacuation. Some routes (walking evacuation routes) are intended to be followed on foot. You will need to know the evacuation routes for your area. 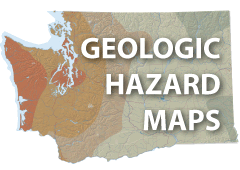 The Washington State Earthquake Hazards Scenario Catalog contains loss estimates for a suite of earthquake scenarios. These scenarios were selected to represent reasonable estimates of the most serious earthquake hazards everywhere in Washington as a basis for planning. In most cases, these scenarios are realistic and have undergone rigorous peer review. Some of these scenarios, however, are hypothetical or speculative, and the recurrence interval, or average time between earthquakes, varies from a few tens of years to a few tens of thousands of years; however, all scenarios are consistent with data included the USGS National Seismic Hazard Map. The loss estimates were produced by Hazus-MH, which is a regional loss estimation tool produced by the Federal Emergency Management Agency (FEMA) and the National Institute of Standards and Technology (NIST). Results are most accurate when aggregated on a county or regional scale. Modeled results depend on accurate inventories. The more complete the inventories, the more accurate the results. Because of their complexity, it is more difficult to estimate losses to lifelines (utility and transportation) than buildings. These data are not a substitute for site-specific investigations assessing the level of risk for an area. They cannot be used to determine the earthquake hazard at a specific locality. Such a determination requires a site-specific geotechnical investigation performed by a qualified practitioner. The Washington State Earthquake Hazards Scenario Catalog is the result of a collaborative effort by the Washington State Department of Natural Resources (WADNR), the Washington Military Department Emergency Management Division (EMD), Western Washington University (WWU), Huxley College of the Environment, Federal Emergency Management Agency (FEMA), US Geological Survey (USGS) and URS Corporation. Following an earthquake, inspectors typically inspect buildings for safety using the ATC-20 Procedures for Post-earthquake Safety Evaluation of Buildings. Green, yellow and red placards are placed on inspected buildings. Green Tagged Buildings: Inspected, no apparent structural hazards found. Lawful occupancy permitted. Yellow Tagged Buildings: Restricted use. The structure has been inspected and found to have damage, described on the placard. Written placard instructions indicate restrictions to entry, occupancy, and lawful use. When this layer is turned on, click on any area of the map to view the number of red, yellow, and green tagged buildings, an estimate of the number of inspectors needed, and estimates of debris created. These estimates are provided for the individual census track clicked, and the county as a whole. According to HAZUS-MH MR4, very little has been done in the area of estimating debris from earthquakes. HAZUS adopts an empirical approach to estimate two different types of debris. The first is debris that falls in large pieces, such as steel members or reinforced concrete elements. These require special treatment to break into smaller pieces before they are hauled away. The second type of debris is smaller and more easily moved with bulldozers and other machinery and tools. This includes brick, wood, glass, building contents and other materials. Using estimates of damage to infrastructure, HAZUS-MH MR4 provides estimates of the structural and nonstructural repair costs caused by building damage and the associated loss of building contents and business inventory. Building damage can also cause additional losses by restricting the building's ability to function properly. Direct building economic loss estimates are provided in 1994 dollars. When this layer is turned on, click on any area of the map to view the direct building economic losses, broken down by structural loss, non-structural loss, content loss, inventory loss, relocation loss, rental loss, wage loss, and output loss. These estimates are provided for the individual census track clicked. The economic loss estimates shown in this layer are limited to those losses that can be directly derived from building and infrastructure damage, and that lend themselves to ready conversion from damage to dollars. The real socio/economic picture is much more complex: economic impacts may have major societal effects on individuals or discrete population groups, and there may be social impacts that ultimately manifest themselves in economic consequences. Building economic loss: Building economic loss is divided into structural and nonstructural loss. Replacement costs are based on 2003 estimates and may underestimate current replacement costs. Building content loss: Building contents are defined as furniture, equipment that is not integral with the structure, computers and other supplies. Contents do not include inventory or nonstructural components such as lighting, ceilings, mechanical and electrical equipment and other fixtures. HAZUS assumes that a percentage of building contents cannot be retrieved at moderate, extensive, and complete structural damage states (5%, 25%, and 50%). Business inventory loss: Business inventories vary considerably with occupancy. HAZUS assumes that business inventory for each occupancy class is based on annual sales. Furthermore, it assumes losses to business inventory most likely occurs from stacks of inventory falling over, objects falling off shelves, or from water damage when piping breaks. Relocation loss: Relocation costs may be incurred when a building or portions of the building are unusable while repairs are being made. In the HAZUS estimate of relocation loss, only the disruption costs of shifting and transferring to a new space and the rental of temporary space is estimated. Rental income loss: Rental income losses are the product of floor area, rental rates per sq. ft. and the expected days of loss of function for each damage state. Rental income losses include residential, commercial and industrial properties. It is assumed that a renter will pay full rent if the property is in the damage state none or slight. Thus rental income losses are calculated only for damage moderate or greater. Wage losses: Income losses occur when building damage disrupts economic activity. Income losses are the product of floor area, income realized per square foot and the expected days of loss of function for each damage state. Earthquakes can cause loss of function or habitability of buildings that contain housing units, resulting in approximately predictable numbers of displaced households. These households may need alternative short-term shelter, provided by family, friends, renting apartments or houses, or public shelters provided by relief organizations such as the Red Cross, Salvation Army, and others. When this layer is turned on, click on any area of the map to view the number of displaced households and individuals needing short-term shelter. These estimates are provided for the individual census track clicked, and the county as a whole. In HAZUS-MH MR4, loss of habitability is calculated directly from damage to the residential occupancy inventory, and from loss of water and power. The methodology for calculating short term shelter requirements recognizes that only a portion of those displaced from their homes will seek public shelter, and some will seek shelter even though their residence may have no or insignificant damage. Households may also be displaced as result of fire following earthquake, inundation (or the threat of inundation) due to dam failure, and by significant hazardous waste releases. This module does not specifically deal with these issues, but an approximate estimate of displacement due to fire or inundation can be obtained by multiplying the residential inventory in affected census tracts by the areas of fire damage or inundation derived from those modules. The hazardous materials module is confined to identifying locations of hazardous materials and no methodology for calculations of damage or loss is provided. If the particular characteristics of the study region give the user cause for concern about the possibility of housing loss from fire, dam failure, or hazardous materials, it would be advisable to initiate specific studies directed towards the problem. The damage shown is based upon HAZUS-MH MR4 estimates of the probability of at least moderate damage to electrical power generation facilities. The electric power generation plants shown in blue are estimated to have less than a 20% probability of moderate or greater damage. The facilities shown in yellow are estimated to have a 20-60% probability of moderate or greater damage. The facilities shown in red are estimated to have over a 60% probability of moderate or greater damage. Click on individual electric power generation plants to see more detailed estimates on the probability of each damage state. HAZUS-MH MR4 defines electric power generation plant damage as moderate when there is some chattering of instrument panels and racks, considerable damage to boilers and pressure vessels, or moderate damage to the building. Fire station damage shown is based upon HAZUS-MH MR4 estimates of the probability of at least moderate structural damage. The facilities shown in blue are estimated to have less than a 20% probability of moderate or greater structural damage. The facilities shown in yellow are estimated to have a 20 to 60% probability of moderate or greater structural damage. The facilities shown in red are estimated to have over a 60% probability of moderate or greater structural damage. Click on individual facilities to see more detailed estimates on the probability of each damage state. Fire stations were added to the default HAZUS essential facilities database using data from the 2007 Homeland Security Infrastructure Program (HSIP). In the cases of missing information from HSIP, default HAZUS values were substituted. Highway bridge damage shown are based upon HAZUS-MH MR4 estimates of the probability of different damage states. The highway bridges shown in blue are estimated to have less than a 20% probability of moderate or greater damage. The highway bridges shown in yellow are estimated to have a 20 to 60% probability of moderate or greater damage. The highway bridges shown in red are estimated to have over a 60% probability of moderate or greater damage. Click on individual highway bridges to see more detailed estimates on the probability of each damage state. Highway bridge data are drawn from the National Highway Planning Network (NHPN) 2005, produced by the Federal Highway Administration (FHWA). Hospital damage shown is based upon HAZUS-MH MR4 estimates of the probability of at least moderate structural damage. The facilities shown in blue are estimated to have less than a 20% probability of moderate or greater structural damage. The facilities shown in yellow are estimated to have a 20-60% probability of moderate or greater structural damage. The facilities shown in red are estimated to have over a 60% probability of moderate or greater structural damage. The hospitals shown here were added to the default HAZUS-MH MR4 essential facilities database using data from the 2007 Homeland Security Infrastructure Program (HSIP). In the cases of missing information from HSIP, default HAZUS values were substituted. The default inventory in HAZUS-MH MR4 contains estimate of potable water pipelines aggregated at the census tract level. This pipeline data was developed using the US Census TIGER street file datasets. By default, HAZUS-MH MR4 assumes eighty (80) percent of the pipes are brittle. The remaining pipes are assumed to be ductile. HAZUS-MH MR4 calculates expected number of leaks and breaks per census tract and a simplified evaluation of the potable water system network performance (i.e. number of households without water). When this layer is turned on, click on any area of the map to view the estimated number of households without water, day 1 of the earthquake. Click on any county to see the number of households without water, number of persons in need of water, and number of gallons needed per day for that county. Injuries and casualties are calculated at the census track level, and aggregated to the county level. Estimates were based upon the 2000 United States Census. The injuries and fatalities shown in this layer are those directly related to damage caused by earthquake shaking. Casualties from induced hazard events -- such as fire following earthquake, hazardous materials releases, and inundations (tsunamis, dam failures, levee failures and seiches) -- are NOT included in this estimation. When this layer is turned on, click on any area of the map to view the number of injuries and fatalities at each severity level for the census track and the county as a whole. Severity 1: Injuries requiring basic medical aid that could be administered by paraprofessionals. These types of injuries would require bandages or observation. Some examples are: a sprain, a severe cut requiring stitches, a minor burn (first degree or second degree on a small part of the body), or a bump on the head without loss of consciousness. Injuries of lesser severity that could be self treated are not estimated by HAZUS. Severity 2: Injuries requiring a greater degree of medical care and use of medical technology such as x-rays or surgery, but not expected to progress to a life threatening status. Some examples are third degree burns or second degree burns over large parts of the body, a bump on the head that causes loss of consciousness, fractured bone, dehydration or exposure. Severity 3: Injuries that pose an immediate life threatening condition if not treated adequately and expeditiously. Some examples are: uncontrolled bleeding, punctured organ, other internal injuries, spinal column injuries, or crush syndrome. Natural gas facility damage shown is based upon HAZUS-MH MR4 estimates of the probability of at least moderate damage. The facilities shown in blue are estimated to have less than a 20% probability of moderate or greater damage. The facilities shown in yellow are estimated to have a 20-60% probability of moderate or greater damage. The facilities shown in red are estimated to have over a 60% probability of moderate or greater damage. HAZUS-MH MR4 defines natural gas compressor station damage as moderate when there is considerable damage to mechanical and electrical equipment, or considerable damage to buildings. Extensive damage is defined as the building being extensively damaged, or the pumps badly damaged beyond repair. Complete damage to compressor stations is defined by complete building damage. Oil facility damage shown is based upon HAZUS-MH MR4 estimates of the probability of at least moderate damage. The facilities shown in blue are estimated to have less than a 20% probability of moderate or greater damage. The facilities shown in yellow are estimated to have a 20-60% probability of moderate or greater damage. The facilities shown in red are estimated to have over a 60% probability of moderate or greater damage. Port facility damage shown is based upon HAZUS-MH MR4 estimates of the probability of at least moderate damage to ports and harbor infrastructure. HAZUS-MH MR4 considers port and transportation systems to consist of waterfront structures, cranes/cargo handling equipment, warehouses and fuel facilities. The port facilities shown in blue are estimated to have less than a 20% probability of moderate or greater damage. The facilities shown in yellow are estimated to have a 20-60% probability of moderate or greater damage. The facilities shown in red are estimated to have over a 60% probability of moderate or greater damage. HAZUS-MH MR4 defined port damage as moderate when waterfront structures experience considerable ground settlement with several piles getting broken and damaged; when cranes/cargo handling equipment experiences derailment and some repair is required, and when warehouses experience moderate building damage. Port data shown are provided by HAZUS-MH MR4 and based upon the US Army Corps of Engineers Ports dataset obtained from Research and Innovative Technology Administration's Bureau of Transportation Statistics (RITA/BTS). This layer shows the location of railway lines. Railway line data shown are provided by HAZUS-MH MR4 and based upon the National Rail Network database, obtained from the Bureau of Transportation Statistics (U.S. Department of Transportation). Railway bridge damage shown are based upon HAZUS-MH MR4 estimates of the probability of different damage states. The railway bridges shown in blue are estimated to have less than a 20% probability of moderate or greater damage. The railway bridges shown in yellow are estimated to have a 20-60% probability of moderate or greater damage. The railway bridges shown in red are estimated to have over a 60% probability of moderate or greater damage. Click on individual bridges to see more detailed estimates on the probability of each damage state. Railway bridge data show are provided by HAZUS-MH MR4 and based upon the National Rail Network database, obtained from the Bureau of Transportation Statistics (US Department of Transportation). School damage shown here is based upon HAZUS-MH MR4 estimates of the probability of at least moderate structural damage. The facilities shown in blue are estimated to have less than a 20% probability of moderate or greater structural damage. The facilities shown in yellow are estimated to have a 20 to 60% probability of moderate or greater structural damage. The facilities shown in red are estimated to have over a 60% probability of moderate or greater structural damage. Schools shown here were added to the default HAZUS essential facilities database using data from the 2007 Homeland Security Infrastructure Program (HSIP). In the cases of missing information from HSIP, default HAZUS values were substituted. HAZUS-MH MR4 default data are based upon the Public Elementary/Secondary Universe Survey Data 2005-06, and the Private School Universe Survey Data 2004-05 maintained by the National Center for Education Statistics, U.S. Department of Education. The Modified Mercalli Intensity (MMI) scale is a seismic scale used for measuring the intensity of an earthquake. It measures the effects of an earthquake on the earth's surface, humans, objects in nature, and the building environment. The scale ranges from 1 (not felt) to 12 (total destruction), often expressed as Roman numerals I through XII. When this layer is turned on, click on any area of the map to view the total population, occupied housing units, number of businesses, and number of employees exposed to each shaking intensity. These estimates are provided for the county clicked. MMI 4: Vibration felt like passing of heavy trucks. Stopped cars rock. Hanging objects swing. Windows, dishes, doors rattle. Glasses clink. In the upper range of IV, wooden walls and frames creak. MMI 5: Pictures move. Felt outdoors. Sleepers wakened. Liquids disturbed, some spilled. Small unstable objects displaced or upset. Doors swing. Pictures move. Pendulum clocks stop. MMI 6: Objects fall. Felt by all. People walk unsteadily. Many frightened. Windows crack. Dishes, glassware, knickknacks, and books fall off shelves. Pictures off walls. Furniture moved or overturned. Weak plaster, adobe buildings, and some poorly built masonry buildings cracked. Trees and bushes shake visibly. MMI 7: Nonstructural damage. Difficult to stand or walk. Noticed by drivers of cars. Furniture broken. Damage to poorly built masonry buildings. Weak chimneys broken at roof line. Fall of plaster, loose bricks, stones, tiles, cornices, unbraced parapets and porches. Some cracks in better masonry buildings. Waves on ponds. MMI 8: Moderate damage. Steering of cars affected. Extensive damage to unreinforced masonry buildings, including partial collapse. Fall of some masonry walls. Twisting, falling of chimneys and monuments. Wood-frame houses moved on foundations if not bolted; loose partition walls thrown out. Tree branches broken. The damage to waste water treatment plants shown is based upon HAZUS-MH MR4 estimates of the probability of at least moderate damage. The waste water treatment plants shown in blue are estimated to have less than a 20% probability of moderate or greater damage. The facilities shown in yellow are estimated to have a 20 to 60% probability of moderate or greater damage. The facilities shown in red are estimated to have over a 60% probability of moderate or greater damage. Click on individual waste water treatment plants to see more detailed estimates on the probability of each damage state. HAZUS-MH MR4 defines waste water treatment plant damage as moderate when is defined by malfunction of plant for about a week due to loss of electric power and backup power if any, extensive damage to various equipment, considerable damage to sedimentation basins, considerable damage to chlorination tanks with no loss of contents, or considerable damage to chemical tanks. This layer on the Washington Geology Portal is a compilation of documented vents (volcanic source centers) in Washington State. Residents throughout the state of Washington are at risk of volcanic hazards. There are five active volcanoes in Washington, and more than seven others in the rest of the Pacific Northwest. These volcanoes tend to erupt explosively and can cause significant damage both near and far. High-speed flows of hot ash and rock, lava flows, and landslides can destroy homes and infrastructure within ~10 miles of the eruption. Enormous mudflows of ash, debris, and melted ice, called lahars, can devastate low-lying areas more than 50 miles away. Data shown on the Portal was compiled from the simplified volcanic hazard maps of Washington's volcanoes by the USGS, found at https://volcanoes.usgs.gov/vsc/multimedia/cvo_hazards_maps_gallery.html. 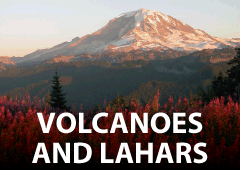 Learn more about Washington volcanoes here. Read more about how to prepare for a volcanic emergency here. During an earthquake, some soils will behave like liquids- a behavior called liquefaction. Liquefaction occurs when water-saturated sandy soil loses strength during severe shaking and behaves like quicksand. Movement of liquefied soils can cause sand blows, rupture pipelines and waterlines, move bridge abutments and road and railway alignments, and pull apart the foundations and walls of buildings. WGS has produced liquefaction susceptibility maps of all counties in Washington. These maps provide general information about liquefaction susceptibility, but are not suitable for site-specific assessments beneath any specific locality. For more information about liquefaction, go to our Faults and Earthquakes webpage. Earthquakes cause damage by moving and shaking the ground, sometimes for several minutes. The shaking can damage or destroy buildings and other infrastructure. Soils can be classified by the National Earthquake Hazard Reduction Program (NEHRP) seismic site class of an area. Site class is a simplified method for characterizing the ground-motion amplifying effects of soft soils during an earthquake by evaluating the relation of average shear-wave velocity in the upper 100 feet of the soil-rock column to the amplification of shaking at ground surface. Shear waves are the earthquake waves that create the strongest horizontal shaking and are the most damaging to buildings and structures. Site class provides some measure of the potential for strong shaking in a particular area during an earthquake. Site class B represents a soft rock condition, where earthquake shaking is neither amplified or reduced by the near-surface geology. Site classes C, D, and E represent increasingly softer soil conditions which result in a progressively increasing amplification of ground shaking. Site class F is reserved for unusual soil conditions where prediction of the amplification of earthquake shaking can only be determined by a site-specific evaluation. On this map we delineate areas of peat soil as site class F. This information is useful when deciding where and how to build. WGS has produced site class maps of all counties in Washington. These maps provide general inforamtion about ground shaking and liquefaction, but are not suitable for site-specific assessments beneath any specific locality. For more information about ground shaking, go to our Faults and Earthquakes webpage. Coal has been mined in Washington since 1853. Although recent production is from surface mines, nearly all coal produced prior to about 1970 came from underground workings. Since early in this century, Washington State law has required mine operators to submit detailed plans of all underground coal operations to the state on an annual basis. About 1,100 individual maps representing about 230 mines compose the Washington State Coal Mine Map Collection. The maps are an invaluable source of information for mine subsidence hazard evaluation and mitigation, structural geology, coal exploration, resource evaluation, and historical research. The areas shown in the layers on the Portal are 'mine areas', not actual map extents. We deliberately do not try to spatially locate mines or mine maps, because quite often, there is not enough geographic information on a map to reliably determine its correct spatial location. Instead, this layer indicates what mines are in a particular general area, and provides a list of maps associated with each of those mines, with access to an electronic version of each map. There are two ways that mine areas are displayed: by Public Land Survey System section (small polygons on the map), and as composite large-area maps (larger polygons). For areas displayed by section, using the 'Identify' tool to click on any section covered by a particular mine area will lead to a list of all maps for that mine, regardless of whether or not each individual map includes any part of that section. For example, the mine area for mine 'K5' (Grand Ridge Mine) covers two sections. There are 20 maps for this mine, each with a Map ID beginning with the mine prefix K5 (K5_A, K5_B, K5_T). Any particular one of these maps may cover areas in only one of the two sections associated with the mine (or may even include some areas outside of the two sections), but will be accessible from either of the two sections designated as that mine's 'mine area'. In addition to the mine areas displayed by section, there are also several composite maps covering large areas. There are a few instances where workings were developed beyond a given mine's 'mine area', but which only appear on a composite map showing the workings of several mines. These composite maps are likely to postdate the latest mine map record for the given individual mine. In such cases, the composite mine map will be cross-referenced to the individual mine listing in the published catalog (Open File Report 94-7) by a notation in the Details column. The original quality of the maps varies. Many mines were carefully surveyed, but some maps are merely sketches. Surface features shown on the maps, such as roads, buildings, and section corners, may have changed, and many maps are tied only to a local base. Additionally, the paper maps are not scale-stable and are in very poor to good condition, so the accuracy of the scale of these scans is unknown and variable. Therefore, projection of the underground mine workings relative to surface locations can vary by as much as hundreds of feet from their actual locations. These are progress maps that may span multiple years, and the collection may not include the final map for a given mine. (If a map in a series is missing, it is not an oversight. We do not have the map.) Subsequent surface mining above some underground coal mines is not shown but is known to have been done at some mines in King, Kittitas, Lewis, and Thurston Counties. Also, this collection does not contain a map for every underground coal mine that has operated in the state. Prospects, small mines, and most mines that operated in the 19th century are generally not represented. Therefore, absence of mapped mine workings does not guarantee that a site in not underlain by a coal mine. Interpretation of the hazard from mine workings should only be done by a qualified geologist or engineer familiar with the geology of the area. Geochronology is the analytical determination of age of a sample of rock to establish its age of formation or to provide limits on a geological event. Absolute methods are usually radiometric, meaning they use the predictable decay of radiogenic isotopes with known half-lives to calculate the age of the sample. However, other methods use other properties, such as observable light emittance or tree rings to better determine age. Relative dating techniques bracket the time frame of formation, and include fossil assemblage identification, paleomagnetism, magnetostratigraphy, chemostratigraphy, or cosmogenic nuclides geochronology. Argon-argon radiometric analyses use irradiation of a sample to convert 39K to 39Ar, and during subsequent incremental heating, each step releases argon having a specific 40Ar/39Ar ratio. Using a half life for 40K of 1.25 billion years with the measured 40Ar/39Ar ratio and irradiation parameter values, the age of the sample can be calculated. Potassium-argon dating relies on the relative proportions of 40K to 40Ar within a sample; this method has been largely superseded by the 40Ar/39Ar method, because the K-Ar results may be too old due to excess argon or too young due to argon loss during weathering and alteration. In both cases, the age of the sample represents the age in which closure temperatures for specific minerals within the rock were met, and may therefore represent a crystallization age, a metamorphic age, or an age of faulting. This method can be used on many rock types as young as a few thousand years old. Uranium-Thorium-Lead radiogenic isotope age determinations are made by measuring the abundances of two uranium isotopes (238U and 235U) and one thorium isotope (232Th) relative to the abundances of their daughter lead isotopes 206Pb, 207Pb, and 208Pb, respectively, using their respective decay constants. The ratio of 207Pb to 206Pb is also measured, which may yield the closest age determination of crystallization, because this measurement is not affected by U or Pb loss as with uranium-dependent analyses. Measurements are typically performed on uranium-enriched mineral separates, primarily zircon and apatite. Ages for these analyses are determined through use of concordia or isochron diagrams. Recent improvements in the technique allow individual grains or fragments of grains to be analyzed on mass spectrometers, rather than bulk analysis of dissolved mixtures of detrital minerals, reducing the chances for anomalously old age determinations. Thus, recent analyses are considered to be generally more reliable than older measurements. Pb-alpha analyses have been compiled into WGS datasets, but the method has been largely superseded by the isotopic U-Th-Pb method. Uranium-lead-based analyses are typically used on igneous rocks older than about 1 millions years. Uranium-Thorium-based analyses can be used on carbonates and fossils over 700,000 years old. Radiocarbon analysis measures the decay of the radioactive carbon-14 isotope (14C) to estimate the age of organic material. This works because when organic matter forms, it absorbs 14C in proportion to the environmental abundance of 14C, and once absorbed, the 14C decays at a predictable rate. The 5,730 years half-life of 14C, the assumed initial abundance of 14C in the sample, and the remaining 14C decay activity are used to calculate the age. The results of this method are refined by correcting for known variations in the radiocarbon content in the atmosphere in the past. Additionally, the date may be further refined by correcting for isotope fractionation based upon the abundances of 12C and 13C in the sample. Radiocarbon analysis is performed on organic material younger than 45,000 years old. Age determinations of tree samples may at times be refined by dendrochronology, if a fully anchored chronology is available. Luminescence dating is the measurement estimate of the amount of time elapsed since an earth material was either fully (n.b., if it wasn't fully saturated, it can yield too young an age) exposed to sunlight (in the case of sediments) or heated (in the case of lavas). This methodology measures the photons emitted from an irradiated material when reheated or stimulated with light; the amount of light produced from the sample is proportional to the radiation dose accumulated when compared to a calibrated sample. Types of luminescence analyses include optically stimulated, infrared, cathodoluminescence, and thermoluminescence. The anlayses are generally perfomed on silt and sand samples between 100,000 and 350,000 years in age. The fission-track method of dating operates under the assumption that spontaneous fission of 238U and other isotopes generate fission tracks in a crystal lattice, and uses the observed track density and measured U concentration within a mineral separate, along with decay constants for spontaneous fission, to determine the age of the sample. Generally, this analysis is performed on zircon and sphene, due to their excellent track retention properties, although it is also performed on other mineral separates, such as apatite, quartz and plagioclase, or on glass. This analysis is typically performed on relatively young samples, due to the effects of fading or annealling of tracks upon reheating. This method can also be used to determine thermal histories of rocks, because tracks are erased within different minerals at different temperatures. The Rb-Sr (rubidium-strontium) radiometric method employs the decay of 87Rb to stable 87Sr to determine the age of a mineral separate or bulk rock sample by using abundances of both Rb and Sr and the 87Sr/86Sr ratio, assuming an initial 87Sr/86Sr ratio, and assuming re-heating did not occur after crystallization. Age and uncertainty are assigned by fitting isochrons to the analytical data. This method is most suitable for determining time of crystallization in acidic and intermediate igneous rocks, although it can also be used to determine timing of metamorphism in metamorphic rocks, and it may be able to determine timing of source rock crystallization or metamorphism in detrital grains within sedimentary rocks. Conversely, rare earth element samarium (Sm) and its daughter element, neodymium (Nd), are most useful in determining ages of ultramafic and mafic igneous rocks. The decay of 147Sm to 143Nd, using the corrected ratio of 143Nd and 144Nd for reference, can be used to generate the slope of an isochron when measured in a suite of related samples to determine age. Fossils are traces of microscopic to megascopic remains of plants or animals found within sedimentary rocks, and their identification and association with a known period of time in the stratigraphic record led to the original development of the geologic time scale. Fossils may consist of partly to wholly remineralized portions of the plant or animal, or may merely be an impression or cast of the organism. The specialized branch of paleontology involves using detailed stratigraphic information and the representative fossil assemblages to determine the relative age of a formation. Empirical radiometric methods of determining age are used to further refine age estimates provided by the fossil record. For more information about fossils in Washington, visit our Rockhounding page. Geochemistry is the study of the chemicals found in rocks, minerals, and fluids. Elements are all around us and are often found as compounds in the environment. Commonly when certain elements, like silicon (Si) combine with oxygen it creates an oxide. These oxides are the building blocks which make up the planets and solar systems and are known as "major elements". Rarely, elements are not bound into a compound. These are commonly known as "trace elements" due to their relative rarity. By studying these major and trace elements, scientists can track the geologic processes that have created or changed the rocks and minerals that we see today. There are a variety of ways that scientists analyze a rock or mineral for its chemistry. The two most common methods are x-ray diffraction and mass spectroscopy. With x-ray diffraction, X-rays are directed towards and are absorbed by the sample. The sample then re-emits its own x-rays that are collected by a detector. The energy and wavelength of the collected x-rays are characteristic of the type and concentration of elements in the sample. This is a non-invasive technique that can be used on delicate objects as no sample is lost or changed in the process. Mass spectrometry involves crushing or dissolving a sample to analyze its chemistry. The sample is then superheated into a plasma by lasers or ionization if solid or liquid. The plasma is then directed through a tube bent around a magnet. The magnet attracts each element towards it differently depending on the charge of the element. Where and how often an individual atom strikes a detector informs scientists both what and how much element is in the sample. This is an invasive technique that will destroy the sample. Geotechnical: Boreholes and pits created with the intent to gain a detailed understanding of the subsurface lithology and soil or rock properties therein. These records have additional data beyond lithologic descriptions including penetrometer resistance, shear and strength tests, density measurements, etc. Lithologic borings: Boreholes are drill solely for the purpose of identifying subsurface lithology. Material testing techniques were not used (or the results are not provided) to allow for a more detailed understanding of subsurface material properties. Test pits: Generally shallow excavations with either hand tools or mechanical equipment that are typically less than 20 feet in depth though may expose a greater area or "working face" to observe the subsurface lithology. Material testing techniques were not used on these pits, or the results are not provided, to allow for a more detailed understanding of subsurface material properties. Water wells: Boreholes drilled with the purpose of extracting or monitoring groundwater. These records often provide detailed hydrologic data including depth to groundwater, flow rates, and draw-down testing that may be used to better understand they hydrogeology of an aquifer system. Chemical testing for potentially hazardous pollutants may also be included for some wells, particularly those focused on monitoring groundwater rather than extraction. Learn more about subsurface data on our webpage. Shear wave velocity (Vs30) is the speed at which seismic waves travel through the uppermost 30 meters of substrate at the Earth's surface. Seismic velocity data consists of p-wave and s-wave data. This type of data is used to quantify and classify the National Earthquake Hazard Reduction Program (NEHRP) site-class data and to construct accurate ShakeMaps in Washington and Oregon. The data is also used to refine ground-motion prediction equations for Pacific Northwest earthquakes. A geologic map can only show what is exposed at the surface of the Earth. To show what lays beneath our feet, geologists make cross sections. Cross sections are imaginary slices into the earth that show how rock units or deposits are arranged below the surface. Geologists use structural measurements, data obtained from water well or geotechnical borings, and various types of geophysical information to help determine the geometry of the geologic map units at depth. Geologic structures, such as faults and folds, are added to geologic maps to show where the Earth's crust has bent or broken. Because of plate tectonics, formations that make up the Earth's crust are broken along faults. The past motion along faults can be measured from centimeters to kilometers depending upon the age and tectonic setting of the fault. Repeated movement along the fault pulverizes the surrounding rock, producing what is termed "fault gouge" by geologists. Faults that break Quaternary deposits are considered potentially active or active, depending upon when the fault last moved. Active faults have the potential for rupture during earthquakes, many geologists do detailed study of these features to better estimate the frequency and magnitude of earthquakes along them. Faults can be classified into three major categories, based on their sense of displacement: normal, reverse, and strike-slip. Different map symbols are used to mark the different types of faults. An beach-side outcrop of young unconsolidated deposits disrupted by a strand of the Dabob Bay fault zone, found recently on the western shore of the Toandos Peninsula, near Brinnon. Folds are also commonly shown on geologic maps. A fold occurs when originally flat surfaces, such as sedimentary strata, are bent or curved as a result of tectonic movements. It is the trace of the "fold axis" of moderately large to large folds that are commonly displayed on geologic maps. These can be small folds that measure centimeters to meters across or can be so large, they may be viewed from space. Geologists map the trace of the fold where it meets the Earth's surface. Retired Survey geologist Josh Logan examining a Mima Mound in a excavation. Note the rich soil within the mound directly above recessional sand and gravel. A geologic map is a special-purpose map made to show geologic features. Geologic maps show the types and ages of rocks and younger deposits that are found at or near the Earth's surface. This fundamental tool for earth scientists, maps show map units, faults and folds, cross sections, and other regional or local features, depending on map scale. Map data is typically shown on a base map, which shows topography, water, and other landmarks. On the Geologic Information Portal, each scale of geologic mapping can be displayed regardless of zoom level. Because geologic maps are inherently scale-dependent, more detail is revealed by choosing a finer scale of geology. At a state level zoom, the 1:500,000-scale map layer generally provides adequate detail, but switching to the 1:250,000- or 1:100,000-scale map layers when zoomed in will provide more clarity. The 1:24,000-scale map layers should only be selected to view the most detailed geologic information and generally require the greatest amount of time to load. Note that when more than one map scale is turned on at one time using labels, labels will overlap. For example, unit symbols for 1:100,000-scale geologic unit polygons will draw above 1:24,000-scale geologic unit polygons. A geologic map classifies rocks and deposits into geologic map units, that are displayed as colored or patterned areas on the map based on unique rock type, age, or depositional setting. In this example, each colored polygon represents a geologic map unit. The unit symbols labelling each polygon signify the units' age, depositional setting, rock type, and formal or informal name. For example, the unit symbol "Qgtv" tells us that its age is Quaternary (less than about 2 million years old), it is composed of glacial (g) till (t), and is part of the Vashon Stade (v). Geologic maps frequently have funny little symbols with numbers next to them. These symbols denote the orientation of planar and linear geologic features such as bedding, lineations, foliations, joints, faults, or other types of fabrics measured in rock outcrops. Geologists usually take these measurements using Brunton compasses. The long axis of the attitude symbol is rotated on the map to show the strike direction or bearing of the feature. The value next to the symbol denotes the dip or plunge of the feature. 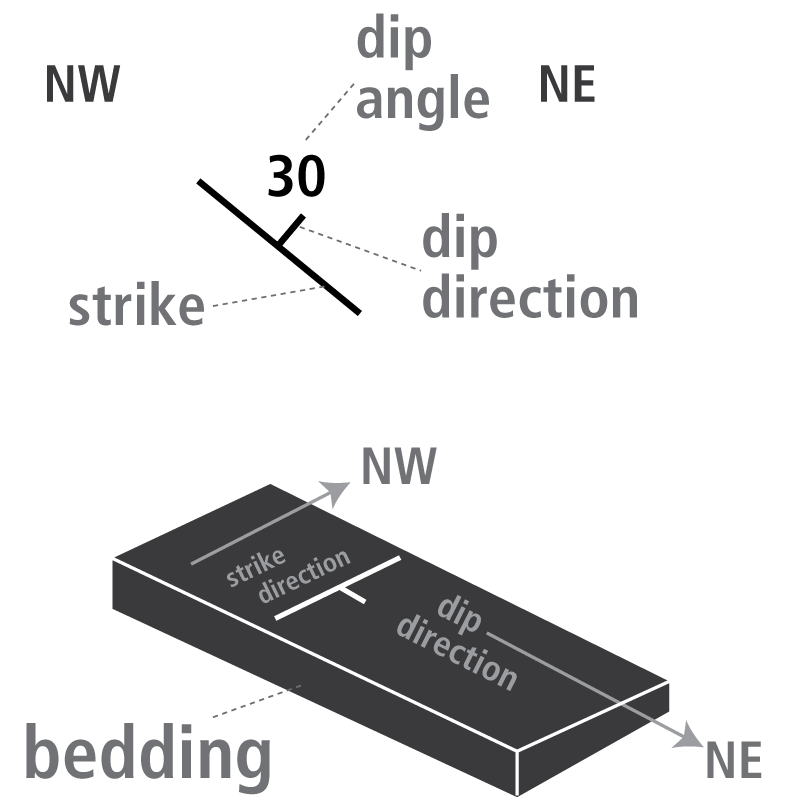 Schematic diagram of strike and dip. 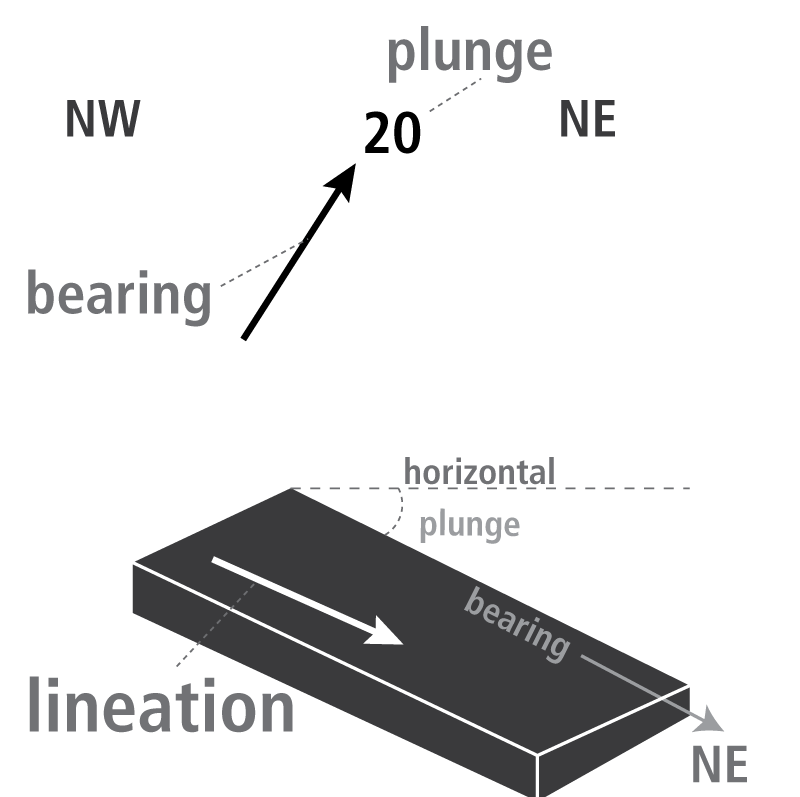 Schematic diagram of bearing and plunge. Contacts are lines that geologists use to mark the boundaries of geologic units, and line symbology will usually denote the confidence the author had in the location or identification of that contact. Sometimes, the contact between two units is actually a fault. 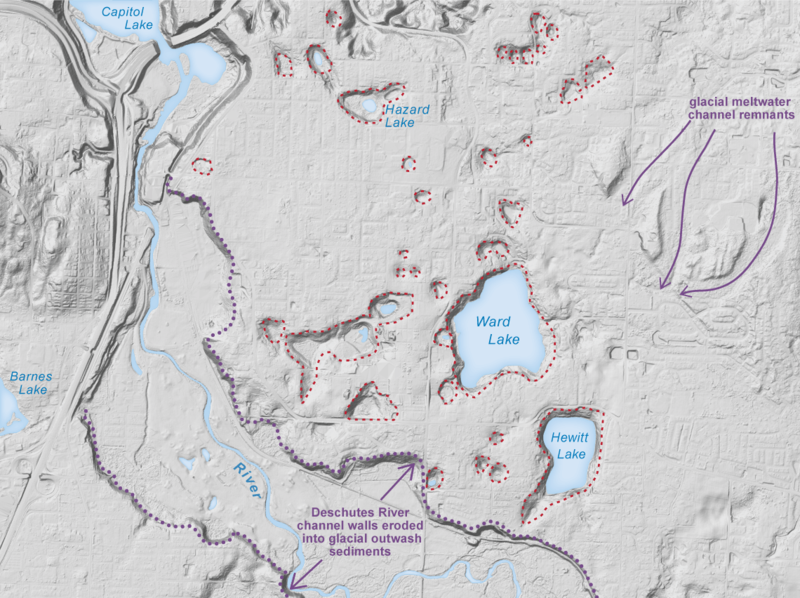 During the Pleistocene, glaciers covered much of western and northern Washington. Geologists can sometimes find evidence that locates the southern limit of glaciation. These locations are depicted as lines on some geologic maps. Cartographers use points on maps to denote localized features. On a geologic map, these locales can include: geochemistry or geochronology sample locations, important geologic units too small to show at map scale, wells or borings, or paleomagnetic sample locations. Cartographers use lines on maps to denote localized linear features that add context and meaning. On a geologic map, these lines can represent: eskers, glacial ice limits, terrace or fault scarps, cross section lines, shorelines, streams, supplementary contours, geophysical survey liens, flow lines on lava flows, and landslide movement directions. Dikes are vertical or near-vertical tabular igneous intrusions that cut through bedrock, forming linear trends across the Earth's surface. Dikes are typically represented on a geologic map by a line. Sometimes, geologists need to show the aerial extent of something that's not a geologic unit. Examples include areas of mineralization or alteration, fault zones, outcrops, geomorphic features, and mineral resources. These polygons are typically overlain on top of geologic units so that both can be viewed simultaneously. Maps are made at varied scales. Map scale determines how much territory is shown by a map. For instance, at a scale of 1:100,000, one inch on the map equals 100,000 inches in the real world-about 1.6 miles. In Washington State, common geologic map scales are 1:24,000, 1:100,000, and 1:250,000. All of Washington has been mapped at 1:100,000 and 1:250,000 scales, but most of the state remains unmapped at the more detailed 1:24,000 scale. Land owners, planners, decision-makers, and others commonly need information at 1:24,000, or even at a more detailed scale. Use your mouse to hover over the photo to compare geologic mapping of the Skokomish-Union area in Mason County at various scales. The left map was mapped at 1:100,000 scale and the right map was created at 1:24,000 scale. WGS and other agencies have put a lot of effort in 1:24,000-scale geologic mapping, but mapping is still nowhere near complete. As maps are published, we add them into the statewide database, shown on the Portal. It's important to note that for this compilation, no effort was made to make units consistent across quadrangle boundaries, or to limit the number of scratch boundaries. The digital data is as closely as possible an exact replica of the publications by the original authors. Other scales of geologic mapping at 1:100,000, 1:250,000, and 1:500,000 have statewide coverage. Paleosols are fossil soils. Soil exposed at the surface can be buried by sediment or volcanic deposits and preserved. They record the climate and vegetation of the time period in which they were deposited, which may be quite different than the climate of today. In western Washington, paleosols are typically rust colored when exposed in outcrop. Glaciers are ice sheets that can be thousands of feet thick and are exceptionally talented at transforming landscapes. It was during the Vashon Stade (the latest ice advance and retreat about 15,000-12,000 years ago) that the Puget Lowland got the extreme make-over that we see today. As glaciers scour the landscape they flow over, sediment is collected and transported within, beneath, and above the ice. Glaciers are capable of moving the smallest of clay particles to very large boulders. Sediment is also transported in milky, silt-laden meltwater streams in front of the glacier's toe. Toward the edge or the terminus of the glacier, sediment is also deposited in large curvilinear hills that are aligned parallel to the edge of the ice sheet, called moraines. Moraines physically mark a period of stagnation for the glacier, where it neither advances nor retreats. During this time of stagnation, the glacier deposits sediments at its terminus moraine. Some moraines can be hundreds of feet tall. Glacial till (diamictite) is unsorted glacial sediment. It is deposited directly at the base of glacial ice. Generally, it is composed of hard-packed clayey silt mixed with numerous irregularly shaped cobbles and boulders that were entrained in the ice as it plucked and abraded the surface. 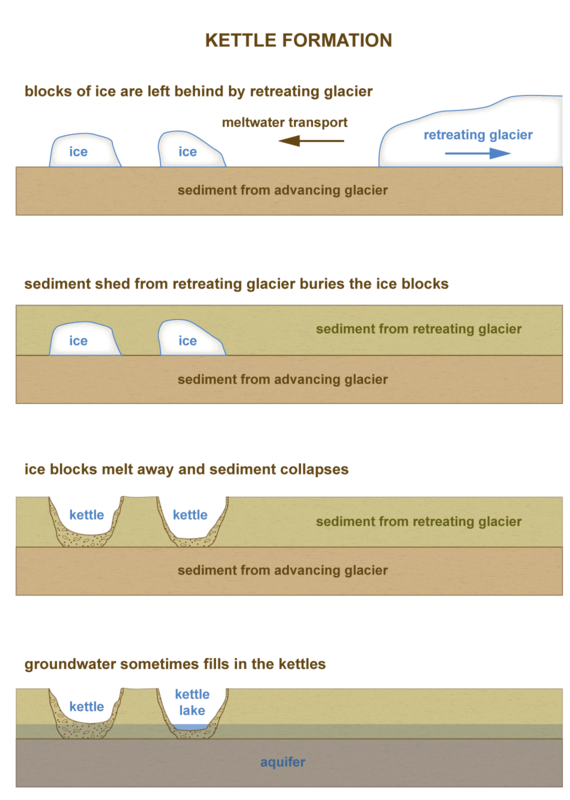 Glaciers produce a lot of meltwater, which subsequently transports vast amounts of sediment. Outwash is a general glacial term describing silt, sand, and gravel deposited in front of a glacier by the meltwater. The sediment is transported either within glacial streams or directly into lakes in front of the glacier's toe. Stream-transported outwash is typically found in broad outwash plains, which are braided stream complexes. Outwash deposited in front of an advancing glacier will be subsequently overridden by the ice and will become compacted, whereas outwas deposited during glacial retreat does not get overridden and is generally less compacted. Kames are the remnants of sediment that were deposited in depressions on the glacier. These sediments collapse once the ice has melted. Kame terraces are geomorphic landforms left behind when glacial ice buttressed the deposition of sand and gravel along the sides of a glacier and subsequently melted. Kames look like long flat benches and are found along the sides of glaciated valley walls. Geologists use the term 'continental' glaciation to refer to the widespread ice sheets that repeatedly advanced and retreated during the last ice age. 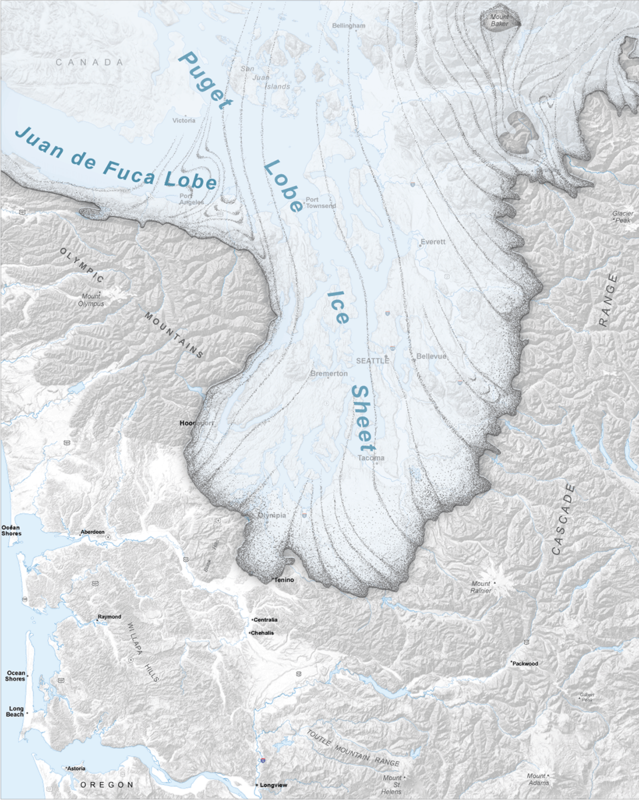 In Washington, ice sheets up to 1 mile thick covered all of northern Washington, with a longer lobe reaching southward to Tenino in the Puget Lowland. Alpine glaciation refers to the localized advance and retreat of ice due to cold climates in alpine settings. Numerous alpine glaciers are long-lived features, covering much of Washington's high elevation peaks. These glaciers expand their footprint during continental ice sheet advances. Oil and gas are naturally occurring resource deposits formed as a result of organic material that is buried and then subjected to heat and pressure. Oil seeps in Washington were first reported in 1881 along the sea cliffs on the west side of the Olympic Peninsula. Natural gas seeps associated with mud cones and mounds were also reported in this same general area. We access these resources by drilling wells. In 1965, the Jackson Prairie natural gas storage project was developed, which remains the Northwest's largest natural gas storage facility. A total of 862 exploratory wells have been drilled in Washington to date, with 249 reporting shows for oil and gas. For more information about oil and gas, go to our webpage. The extraction of materials from a site such as sand and gravel, stone, clay, coal, industrial minerals, metallic substances, peat, or topsoil requires an active reclamation permit. Surface mines are regulated under the Surface Mine Reclamation Act enacted in 1971, which requires a permit for each mine with more than 3 acres of disturbed ground or a high wall that is both higher than 30 feet and steeper than 45 degrees. The Surface Mine Reclamation Act was amended in 1993 to insure that every mine in the state is thoroughly reclaimed. The Department of Natural Resources is responsible for seeing that reclamation is completed after surface mining and has exclusive authority to regulate mine reclamation and approve reclamation plans. The basic objective of mine reclamation is to re-establish the vegetative cover, soil stability, and water conditions at the site. Mines may be reclaimed for fish and wildlife, grazing, forestry, wetlands, residential,and commercial and industrial uses. Mine operation, which includes all mine-related activities except reclamation, is specifically regulated by local governments or state and federal agencies exclusive of the Department of Natural Resources. For more information about the Surface Mine Reclamation process, or to access fee schedules or forms, go to our webpage. Much of our geothermal data is obtained from temperature-gradient wells or water wells where logging equipment was used to gather detailed temperature profiles. A temperature gradient is then calculated from this data in degrees C per kilometer. Water well records where temperature was recorded can also be used to estimate a representative temperature-gradient using an assumed surface temperature in the area of the well. These data typically hold less scientific value compared to geothermal wells logged specifically for temperature data. For more information about geothermal resources in Washington, visit our webpage. General schematic of direct-use, courtesty of the U.S. EPA. Heat from under the earth's surface can be harnessed and used in many residential and industrial ways. This is done by using a direct-use geothermal heat pump and either an open- or closed-loop system. Closed-loop systems feature loops of piping filled with a mixture of water and refrigerant. These loops are buried (either vertically or horizontally) in the ground and connected to a heat pump at the surface. The pump forces the water mixture underground where the earth's temperature heats it. This heated water is then returned to the heat pump where it can be used to heat or cool a building. General schematic of closed-loop system used for heating, courtesty of the U.S. EPA. General schematic of closed-loop system used for cooling, courtesty of the U.S. EPA. Open-loop systems work in much the same way except that the water is not contained within the system. The hot or cold groundwater is extracted by a well, run through a heat pump, and then discharged back into the earth by another well. This system is less desirable due to the need to discharge water and the effects of untreated water on the mechanical parts of the pump. General schematic of open-loop system, courtesty of the U.S. EPA. Washington State has many cold, thermal and (or) mineral springs as well as fumaroles. Mineral springs are naturally occurring springs that contain dissolved minerals. Thermal or hot springs are heated geothermally and may be as small as a single seep to very large in size. Fumaroles are openings on the earth's surface which emit steam and other gases. Chemical analyses, temperature measurements, and photographs for selected springs are available through the Portal, and more information about geothermal resources can be found on our geothermal webpage. Geothermal favorability of Washington State. In order to gain a broad understanding of the geothermal resource potential and favorability for development in Washington State, we have developed an approach to determine the spatial association between various geologic and thermal features, infrastructure, and land-use. The color scale provides a ranking of favorability for exploration and development of moderate- to high-temperature geothermal resources; warmer colors indicate higher favorability. The color scale is based on weighted raster overlay layers, including: (1) modeled geothermal potential; (2) proximity to transmission lines, and (3) elevation restrictions. The model is not meant to be used to locate areas for exploration on a site-specific basis, and should not be used at a scale greater than 1:250,000. Download the Geothermal Favorability of Washington publication (OFR 2014-02). There are over 500 volcanic vents in Washington State. A volcanic vent is an opening on the Earth's surface where magma and gases are emitted. All volcanoes have a central vent which is connected to the subsurface magma chamber that supplies volcanic materials. Different types of volcanoes produce different kinds of lavas. The volcanoes in Washington produce lavas mainly composed of dacite or andesite. For more information about volcanoes, visit our volcanoes page. Aspect refers to the position of a feature in a specified direction. In terms of elevation data, the aspect is the direction in terms of degrees that the terrain is facing. For example, an aspect of zero describes terrain facing due North, which an aspect of 180 describes terrain facing due South. Aspect derived from elevation data can be useful in planning assessments (how much sun exposure will a building receive) or for habitat analyses and modeling, as slopes facing a certain direction may receive more or less rain, for example. Slope is a measure of the steepness of the terrain. It can be measured in terms of percent (for example, an 8% grade on a road) or in terms of degrees. A hillshade is a grayscale rendering of the terrain which uses a simulated sun angle to shade and model the terrain features. A hillshade appears more like the terrain you might view from an airplane. A DEM is an acronym for Digital Elevation Model. Similar to a digital image where individual pixels contain red, green, and blue values to describe the color of a feature at that location in space, a DEM pixel contains the height of the elevation at that location. A DSM is an acronym for Digital Surface Model. This is a type of DEM that specifically describes the "top surface" elevation. If a loose blanket were draped over the topography, the DSM would represent the elevations of the topography taking into account trees, buildings, and towers. A DTM is an acronym for Digital Terrain Model. This is a type of DEM that specifically describes the elevation of the ground surface, or a "bare earth" model. If all of the trees, buildings, vegetation and towers could be removed leaving only the bare ground beneath, the DTM would represent that topography. Lidar is an acronym for Light Detection and Ranging. By pointing a laser at a surface at closely spaced intervals and measuring the time it takes for light to return to the source, very accurate three-dimensional information can be obtained with sufficient measurements. Billions of these measurements can yield an extremely detailed three-dimensional rendering of the terrain. For more information, visit our Lidar page. A LiDAR sensor sends out several light pulses per second and receives multiple returns from different objects from each pulse. The calculated position of a return is called a point. By calculating the position of every return, a "point cloud" can be derived to show the positions of all returns. Point density is a measurement of the number of points (returns) per unit of ground distance. For example, if you counted the number of points in a point cloud within one square meter, the number would represent the point density. Or, if there are 10 points within a square meter in the point cloud, the density is "10 points per square meter". When the sensor sends out a pulse of light, that light may illuminate multiple objects on the ground. The light then bounces off those objects and is returned to the sensor as returns or "points". The First Return is the first measurement to be received back by the sensor. Often, it might represent what the light pulse hit first, or what is tallest in the scene, such as a tree. First returns are also used to generate a Digital Surface Model. Similar to first return, the Last Return is the last measurement to be received back by the sensor from a single pulse of light. Often, it represents the last object the light pulse hit, or what is furthest away in the scene, such as the ground surface. Last returns are used to generate Digital Terrain Models. Resolution typically refers to the pixel size of an image. For example, a 3-foot resolution DEM means that each pixel represents a 3-foot by 3-foot cell on the ground. This is important information when working with DEMs because it helps define the level of detail that can be resolved in the scene. A 30-foot resolution DEM may only distinguish large buildings and features, whereas a 3-foot resolution DEM may identify smaller buildings, road surfaces and individual trees. Gravity surveys identify density differences in rock formations. This is useful for identifying the depth of bedrock under unconsolidated sediment. Gravity surveys can also locate contacts between two distinct densities of rock at depth. Gravity surveys are conducted in the field using many methods. Geologists set up a gravity base station as well as a mobile station to periodically compare the collected gravity data because of daily and hourly changes in Earth's magnetic field. This data is then used to calculate the gravity measurements. Learn more about gravity on our Subsurface Geology page. Geophysicists use magnetometers to identify magnetic contrasts in rocks. Magnetic surveys can be performed on the ground, but large areas can be covered using airplanes. Sharp contrasts in magnetic susceptibility can indicate faults, folds, or geologic contacts between magnetic and non-magnetic minerals. Learn more about magnetics on our Subsurface Geology page. Ground penetrating radar (GPR) is a method of imaging the subsurface using nondestructive radar pulses. The radio wave travels through the subsurface and bounces off of soil and rock layers. Faults, contacts between different rock types, and discrete objects like boulders or voids are then visible. GPR has a variety of effective depths (generally less than 100 feet in depth) and resolutions, depending on the type of equipment used and soil conditions at each site. Learn more about subsurface geophysics on our webpage. Seismic surveys are commonly categorized as either active or passive. In active seismic surveys, the geophysicist creates a seismic wave by hitting the ground with a hammer or using an air-gun if in water. In rare cases, small explosive detonations may be used to create a seismic signal. In passive seismic surveys, the geophysicist uses naturally occurring seismic waves or the "background noise" as the seismic source. These data can help researchers identify faults and other structures, and aid in understanding the seismic hazards of our state. All active seismic surveys, regardless of the size of the study, involve sound waves generated from a sources that travel through the ground, are refracted, and are then received by detectors. The speed at which the waves travel tells us a lot about what layers are made of and how they are arranged. The resistivity of a material is a measure of the resistance of electrical current. To test this, geologists introduce a current directly into the ground using electrodes. Different types of materials return different resistivity values. The data can be interpreted to tell geologists the depth of a water table, the composition of subsurface materials, idnetify faults, or characterize the leakage of fluids from fractures or other sources such as dams. In order to learn even more about subsurface conditions, geologists sometimes conduct down-hole geophysics. This is done by lowering a probe down a well or borehole. The probe collects continuous data that is then graphically displayed on a computer log. Different types of rocks, sediment, and fluid have diagnostic characteristics when bombarded with electrical, acoustic, or radiometric testing. Often combinations of one or more of these types of tests are performed within the same borehole to fully characterize the subsurface lithologies, moisture content, density, etc. These logs are most often used by the oil and gas industry, but can also be used for geotechnical, geothermal, or environmental applications.